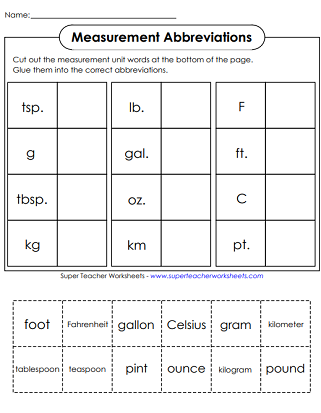 This page has a series of worksheets and printables to help students learn proper English abbreviations. Includes months, days of the week, personal titles, and measurement. Write the abbreviation for each day of the week or month shown. Then write the full word for each abbreviation shown. Then complete the short answer thinking question. Answer each question with a correctly formed abbreviation. All question answers are months or days or the week. If an abbreviation is written correctly, color the bubble green. If it is written incorrectly, color it red. Alphabetize the seven days of the week. Then write the abbreviation for each day. Cut out the measurement units and glue each next to its abbreviation. Includes metric and standard units. Celsius, Fahrenheit, teaspoon, tablespoon, foot, gram, gallon, ounce, pound, pint, kilometer, and kilogram. This map shows all 50 states and their abbreviations. On the second page, students write the full name of each state. 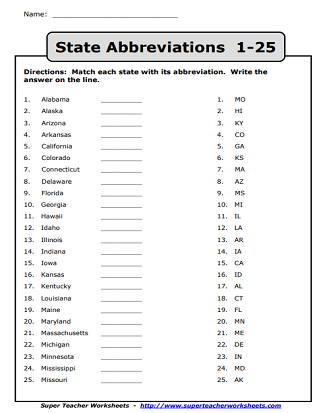 Match each state with it's abbreviation. Part 1 (this file) includes Alabama through Missouri. Match each state with it's abbreviation. This file (part 2) includes Montana through Wyoming. Choose the abbreviation from the word bank the corresponds with the word shown. Write the full word for each abbreviation shown. Includes: road, highway, gallons, mister, doctor, minute, meter, foot, and more. 24 questions in all. Read each word and write its abbreviation on the line provided. This page has many printable writing-related activities. 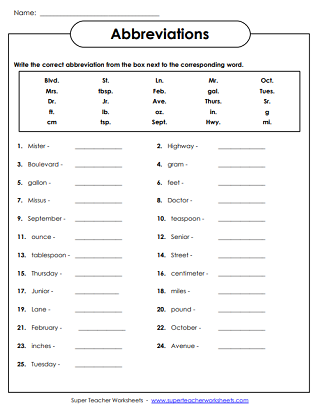 This page has worksheets on nouns, pronouns, adjectives, adverbs, and other parts of speech.